The C-8 Deluxe is an ambitious undertaking that definitely fills the eight-string brief, but don't go playing it through your practice amp! Like the C-6 and C-7, the C-8 Deluxe has a thin maple neck bolted to a basswood body, and features Schecter Diamond Series Plus humbuckers in neck and bridge positions. 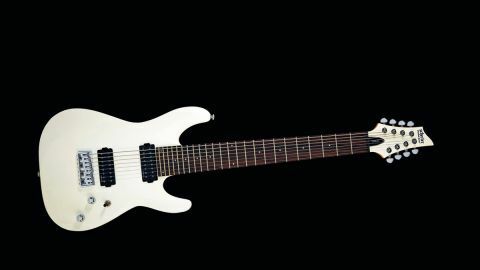 The intent from Schecter is clear: budget-focused, entry level, the C-8 Deluxe is an economically attractive proposition that will be pitched against similar models from Jackson and Ibanez. But a budget eight-string guitar was always going to be the most ambitious project. It shares the C-7's sculpted and unobtrusive heel, and similarly will push its pickups to the limit with its lower register. The C-8's neat hardtail, string- through body bridge is super- comfortable to rest the picking hand on - a huge plus given that the C-8 is designed with chugging in mind. But unlike its C-6 and C-7 siblings, the C-8 feels imbalanced and all neck. It isn't as heavy as some extended-range guitars but, on this evidence, maybe we have to accept that if we want a beefed-up instrument to trade blows in lower registers we're going to have to heft a real lumbar-threating guitar built from something heavier than basswood. In the lower registers, there's a lack of definition, especially with heaps of gain, meaning that it's more suited to note-heavy rhythm playing than voicing chords. Perhaps it's unrealistic to expect better performance at this price, but there is an existential question to be asked of a starter eight-string such as this. Is this a 'beginners' guitar, in the sense that it's someone's first axe? If so, it's fit for purpose, though we'd question whether the average first practice amp could handle the low-end output. If it's meant to tempt experienced six-string players into trying the eight-string, however, it may feel a tad rough 'n' ready.